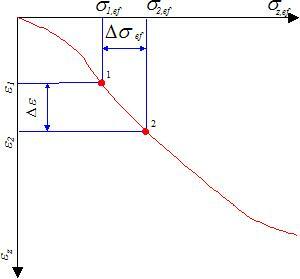 If the results from oedometric test are represented in terms of oedometric curve (Δε = f(Δσef )), it becomes evident that for each point on the curve we receive a different ratio σef /ε. In general, the oedometric modulus of deformation Eoed tends to decrease its value with the increasing stress interval. Therefore we should consider for each layer a specific value of Eoed pertinent to a given stress interval (from original to final stress state). This is reflected in the program by the way of inputting Eoed, where it is possible to specify for each soil the respective oedometric curve (σef/ε diagram). Practical experience, however, suggests (e.g. for clays) a several orders of magnitude difference between the value of Eoed derived from the deformation modulus Edef and that provided by the in situ measured loading curve. Vanicek, I.: Geomechanika 10: mechanika zemin. 3th edition, Prague, CTU, 2000, 229 s., ISBN 80-01-01437-1.